Ardent hunters, survivalists and outdoor enthusiasts probably know Morakniv for being a populist European brand with one of the most solid reputations in the knife industry to show for. Mora – as it is popularly known among knife aficionados – somehow has a knack for manufacturing affordable, everyman’s, fixed blade knives – in the town of Mora somewhere in Sweden – with all the right blend of features that make up for reliable outdoor tools. The Morakniv Companion Fixed Blade Outdoor Knife, paints the perfect picture of what the brand truly represents since its inception 1891 and if you are in the market for a reliable, hunting “companion,” this product may just end up being your safest bet. It is a sturdy, lightweight knife designed for virtually any outdoor activity ranging from hunting to camping. Let’s dive right in and have a look at the nitty-gritty of the Mora Companion Knife, shall we? As usual, we take an in-depth look at how this knife sizes up as a self-defense, utility, outdoor tool for the ardent hunter. Enjoy! The blade on the Companion is basically crafted from high-quality Swedish Sandvik 12C27 steel; in other words, one of the sturdiest materials you can find in the niche. Its superior hardness rating of HRC 56 – 58 provides unparalleled toughness only found in few premium brands lying in the industry’s upper echelon. The Sandvik blade is exceptionally thick with an innovative Scandinavian grind comprising of a short bevel that leaves extra steel to support the spine. This innovative design makes it ideal for aggressive applications that exert immense pressure on the knife’s spine similar to swords and the best part is, you won’t have to worry about the Companion chipping or breaking while at it. The Sabre Scandinavian grind adopted on the blade also makes it extremely easy to sharpen, as you don’t have to focus hard on the angles. The Companion Heavy Duty Knife boasts a deep bellied handle with a cozy rubberized grip. In short, you can be guaranteed of a firm, yet comfortable grip regardless of whether your hands are wet or not – it will stay firmly placed in your hand. If you take a close look at the handle, you will notice the patterned, high friction grip designed for extra control, greater performance and sufficient safety. In a nutshell, it is exactly the type of knife you want in your hands in messy situations. While some manufacturers overdesign their handles with extra embellishments such as parrot beaks, finger grooves and palms swells which may ultimately become too much, the Companion stands out for taking the plain and simple route. Unlike most premium knives that sport a leather-crafted sheath, the Mora Companion’s sheath is made from rigid; friction fit plastic material – typical Mora fashion. While it isn’t as aesthetically pleasing as leather, it will stay put when not in use, besides allowing quick and easy disengagement in case of danger – the main idea anyway. For simplistic carrying, the sheath sports a belt clip – thoughtful feature for backpackers and a convenient drain hole to mitigate moisture build-up. Sure, leather sheaths are more preferable more so for premium knives of the Companion’s caliber, but the rigid plastic, friction fit sheath proves to be quite reliable in regards to safety and mobility. The Mora Companion is built with efficiency and comfort in mind. For starters, it sports a reliable blade length of 4.1 inches and thickness of 2.5 mm. The whole package stands at an impressive overall length of 8.7 inches and weight of 4.1 ounces. In a nutshell, this is a lightweight tool – further enhanced by the plastic sheath – that can exceptionally take any form of abuse you throw its way, without caving in. The handle precludes any form of finger crowding and the fact that is one of the lightest, yet comfortable knives on the market make it a bargain for its price. Scandinavian grind blade design that allows easy sharpening. Lightweight knife and sheath for extra mobility and comfort. Short bevel that leaves additional steel to support spine; ideal for aggressive applications. Sturdy Sandvik 12c27 stainless steel – corrosion-resistant. Comfortable grip free from finger crowding. Belt clip on the sheath for convenient carrying. The short blade requires the user to apply more effort in some outdoor activities. The sheath may crack or even break if not properly handled. Color matching sheath with belt clip. High-friction, patterned grip handle for enhanced comfort and user-control. Hardened Sandvik 12C27 stainless steel blade; corrosion-resistant. 4.1-inch-long blade with a thickness of 2.5 mm. Q. 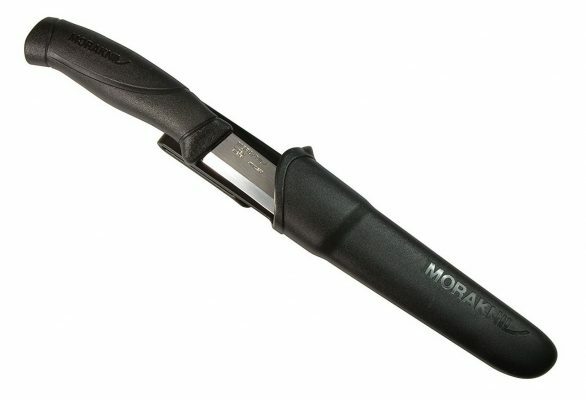 Can I use an electric knife sharpener to sharpen the Mora Companion? A. Electric knife sharpeners should be avoided if possible as they tend to overheat the blade, which as a result weakens the carbon steel. You are better off using whetstone and a leather strop to finish the sharpening process. Q. Does the knife come in a variety of colors for the handle and sheath? A. Yes. You have a wide array of color schemes to choose from, meaning it shouldn’t be a hassle finding one that tickles your fancy. Q. What makes the knife light? A. It is a combination of features. For starters, stainless steel is lighter compared to, say, Cro-Van steel material. Secondly, the rigid plastic material used to make the sheath also goes a long way in making the Companion one of the lightest knives on the market. There is a great distinction between good knives for the price and good knives – the Mora Companion technically offers both. If you are in the quest for finding a reliable survivalist knife or effective hunting knife, this product will no doubt serve your needs in optimal fashion. Regardless of whether you are a beginner or pro hunter looking for a versatile knife, you can never go wrong with the Morakniv Companion Fixed Blade Outdoor Knife and rightfully so.